The Cane Creek Helm Coil in all its glory. 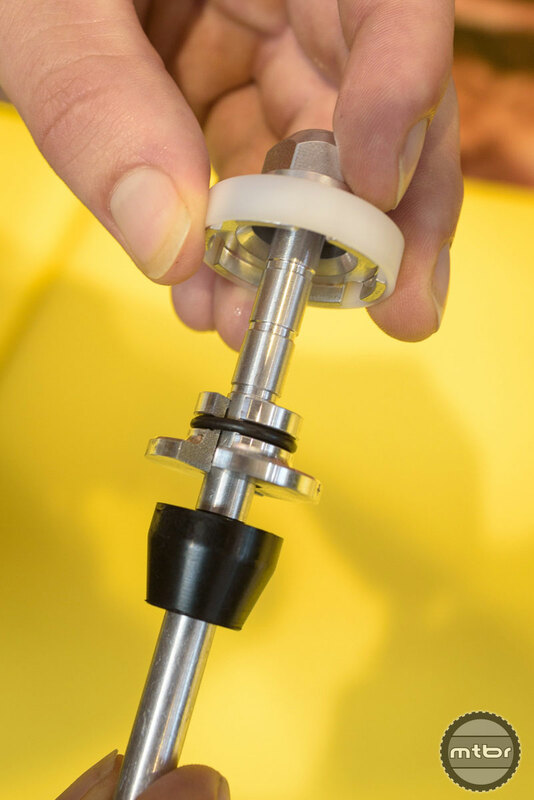 Taking off the cover gives you access to the bolt that you need to unscrew to open the fork leg so you can change the coil or the fork’s travel. 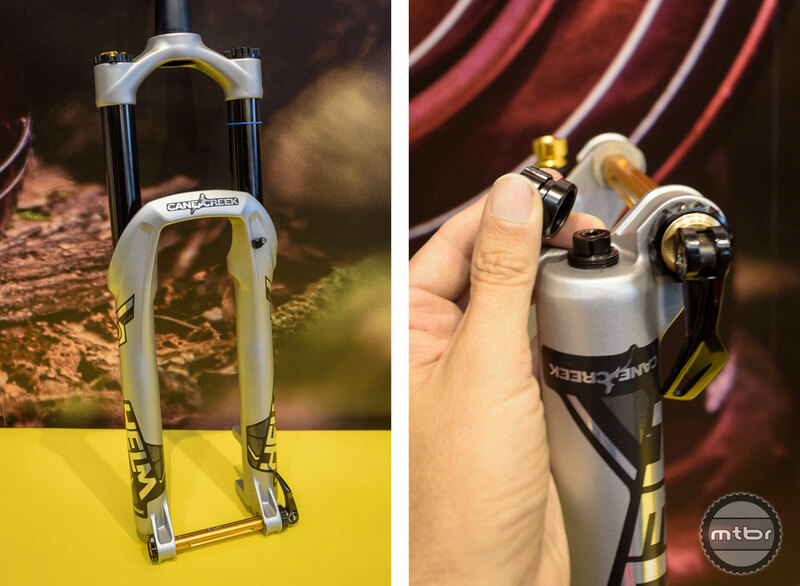 With a weight of 2250 grams (versus 2050g for the air version) the new Cane Creek Helm Coil fork offers you the advantages of coil-driven suspension with only a small weight penalty. The Helm Coil is intended for bikes with 130mm-160mm of travel. While the adjustment possibilities of air suspension forks are getting more elaborate, the coil version of the Helm is more a set-and-forget product. The first choice that you have to make is which spring rate you’ll use. Cane Creek offers a choice of three: 45, 55 or 65 pounds/in. Once you’ve figured out the ideal spring rate, you can fine tune preload, which is divided into 16 clicks on the dial on top of the left fork leg. 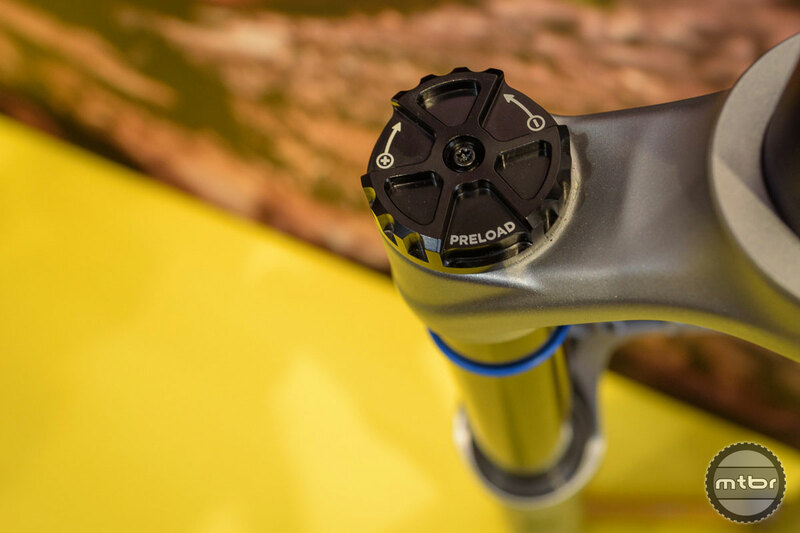 The 35mm stanchion fork also offers a Delrin piston instead of the normal air piston. Delrin is an extremely smooth material that insures stictionless motion along the fork stanchion. The Helm Coil is delivered at 150mm or 160 mm travel from the factory, but can easily (without special tools) be adjusted from 130mm up to 160mm in 10mm increments. The internals of the spring side of the fork. According to Cane Creek, the coil has a pretty linear spring curve and it offers superb mid-stroke support. 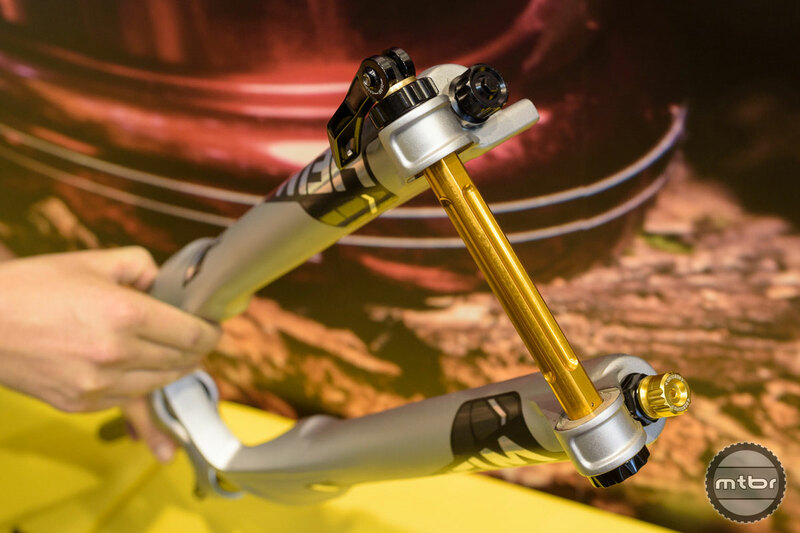 The fork is set up with about 5mm less sag than the air version, which ensures a better feel on steep descents and also offers the advantage that the fork is less dive prone while braking. The fork lowers. On the left the spring leg, on the right the damper leg with the gold colored rebound adjustment knob. Apart from the normal cleaning, one big advantage of the coil suspension is that there’s almost no service needed, so you really get a hassle free high end fork that’s designed for continuous use on rough trails. The Helm Air and Helm Coil share the same damper. The Helm Coil uses a post mount disc brake with a minimum rotor diameter of 180mm. The forks come with the “D-Loc” 15 mm thru axle system, has 15mmx110 boost spacing and a 44mm offset. Availability is set to the end of 2017. Price is $1100. For more info visit www.canecreek.com. The internals of the spring side of the fork — coil not shown. Tool free adjustment from 130 mm up to 160 mm in 10 mm increments — the white ring on top blocks the metal spring adjusment parge below. The indents on the rod indicate the 10 mm travel increments. The Cane Creek Helm Coil in full glory. 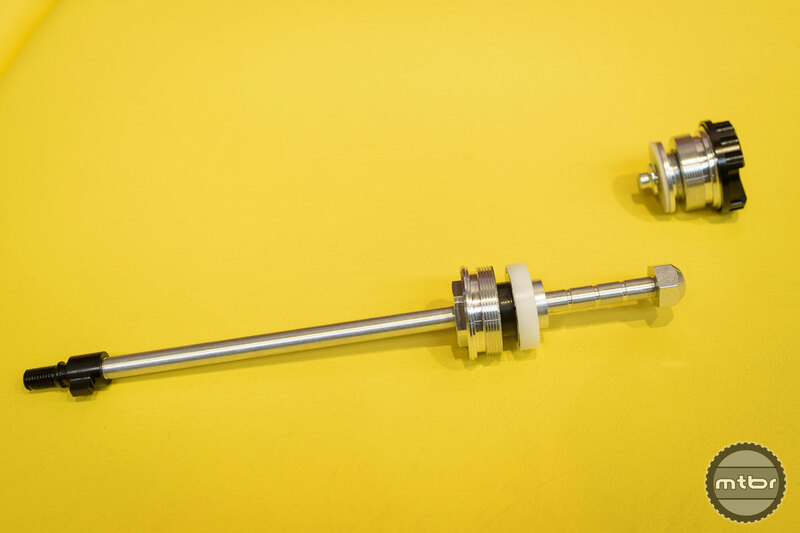 Taking off the cover gives you access to the 18 mm bolt which you need to unscrew to open the fork leg, so you can change the coil (three spring rates available) or the fork’s travel. 16 clicks of 0,5 mm preload adjustment make 8 mm of total adjustment on the preload dial. The fork lowers: on the left the spring leg — on the right the damper leg with the gold colored rebound adjustment knob.